Monday… You have not been missed. But before I am going to face reality, let’s reminisce about last weekend. To celebrate the fact the weekend had started, me and a bunch of others treated ourselves to some tasty all-you-can-eat sushi at Hato Popo on Robson Street. Despite the fact we had to wait some time to get our food, the delicious California and Spring rolls were definitely worth it. After dinner we went to Bart’s place to have a few drinks and play games. On Saturday, I woke up the best way possible. The sun was shining! Considering this was the first morning (and afternoon) since I arrived that I did not have any plans, I decided to relax for a bit and watch videos on my laptop. This was the perfect day to have free time considering I watch a Dutch television show named ‘Wie is de Mol’ (Who is the Mole) and the finale was live on TV that day. Thankfully, I was able to watch it via a live stream. When the show ended I decided to leave the hostel, walk around the city and enjoy the sun. In the evening I joined many others at the St. Patrick’s Festival Kick-Off Party at Blarney Stone. It was a great night filled with dancing, nice drinks and live music from the band The Shenanigans. If you were not there, you definitely missed out! On Sunday, I decided to go to the city centre and visit shops. One of my favorite shops I visited is definitely the Disney Store, which always makes me feel like a kid and as if I am living in a magical world. As a Dutch person, exploring and doing my practicum here in Vancouver is pretty magical to me too. I hope you all had a great weekend and I wish you a good start of the week. See you on Wednesday for PuB NiGHT at 131 Water! Team wet pigs and team so good were ready to start the Trivia. While the waitress was serving us some food and drinks, we were thinking about the answers of all the questions appearing on the screen. After every round was a bonus question where you could win a pitcher of beer. Unfortunately, we were not smart enough to win a pitcher of beer. We got the score back at the end of the game and we were not that bad. But some other people were a little smarter than us, so no prize for us. After the Blarney Stone with went (of course) to the Metropole to sing our songs. It was not that busy this time, so we could sing many songs. Blarney Stone is a really fun pub in the weekend if you like Irish music. Every weekend there is a live band playing and people dancing all around. During the week they have nice events organized and you can often find a organized party here as well. It was a lot of fun playing trivia with you guys. I hope everybody is rested enough for the ice-skating tomorrow. Let’s get hurt ourselves on the ice! Or not if you are familiar with ice. However, I hope to see you at Robson tomorrow! Yesterday’s PuB NiGHT was at Blarney Stone. It was great to see so many people showing up for PuB NiGHT. Thank you all for joining us! Blarney Stone is an Irish pub in Gastown. On Fridays and Saturdays there is a live music band that is playing Irish songs. As it is an Irish pub they also have a big variety of Irish whiskeys. Besides that they also have a pretty big variety of beers and ciders too. 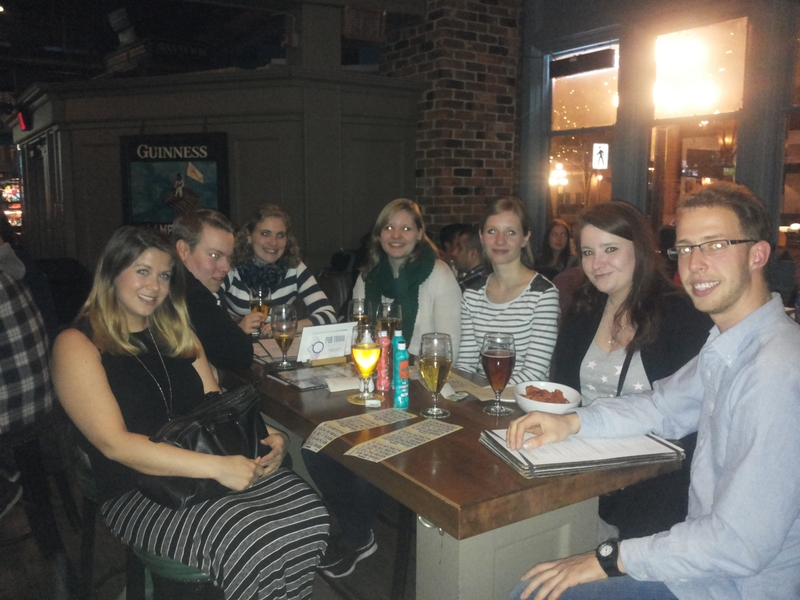 On Wednesday the pub has Trivia night, so we also tried it out with a pretty big group. After a while we noticed that the questions were way harder than expected, so after the first round we were so happy with just the 12 points that we got. There were more and more people arriving during our trivia and it became harder to actually concentrate on the questions, so we decided to quit with trivia. After the trivia I had time to talk to everybody and catch up with all of you guys. As it was Marie’s, Merle’s and Alex’s last PuB NiGHT, we decided to go to the Met for some karaoke. Here we started off singing Dancing Queen with each other and we ended the night well with our INTERNeX song. I hope you all had a great night, because I certainly did! See you on Saturday at the Stanley Park bike ride! This week was a busy and great week with all the Scandinavians in Vancouver. They were here for only 3 days; right now they are heading to their work in a ski resort. Most of them arrived on Tuesday evening and already met each other at the airport and went straight to their hostel. On Wednesday we had a long day full with orientations. We picked them up at 8 AM, went to the SIN office and after that to the bank to get them a bank account. When all of that was sorted out we walked to the INTERNeX office and ate pizza. After the lunch break we did the INTERNeX orientation, sorted them out for PhoneBox monthly plans and gave them an introduction about TaxBack. Finally all parts of the orientation were done and we went to the Bismarck Bar for a PuB NiGHT where the other candidates from INTERNeX also came along to enjoy a great PuB NiGHT. On Thursday we did a Stanley Park Tour which was a long walk, but lots of fun. We first walked to the Waterfront, from there on we walked to Stanley Park where we started of with seeing the Totem Poles, afterwards we walked into the actual Stanley Park. We saw a lot of beautiful things, a really big tree where we could stand in and the Lost Lagoon. We also saw squirrels and even a raccoon!! Then it was already the end of the tour and went back to the hostel to get ready for the Canucks game. We gathered around 6 PM at the INTERNeX office to get the tickets and went to see the game. The Canucks lost, but it was still a great experience to see a hockey game! On Friday we planned another PuB NiGHT at Blarney Stone to end the great time with the Scandinavian candidates before they leave to the ski resort. We had lots of fun! We hope you all will have a great time working at the ski resort!! Our team Die Gummibärenbande tried its best to answer last night’s trivia questions but some of them were really difficult. Looks like we all need to study up some more! It was still lots of fun guessing at random questions and playing the mini games in between. After the trivia event ended some of us got into talking about television shows we used to watch when we were children. We had shows like the Teletubbies, Power Rangers and also series specific to our own countries come up. That was quite a nostalgic ride back into our childhoods! 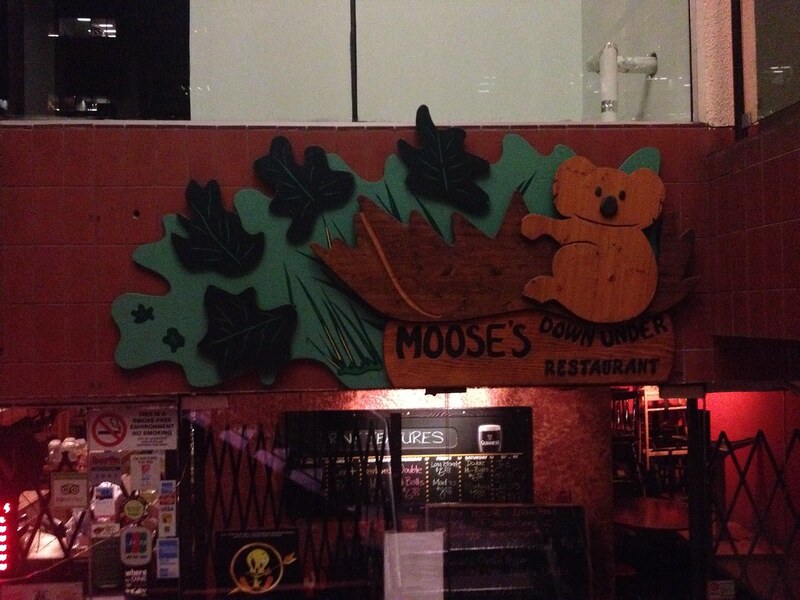 Soon after Moose’s Down Under was beginning to close up so we decided to move on to the next place, especially because since it was Laura’s, one of our INTERNeXers, last night in Canada. We went to her favorite pub the Blarney Stone! Here we had a couple more farewell drinks while everyone wrote goodbye notes on a flag to remember us by. Eventually, we had to reluctantly call it a night and parted ways with promises of a reunion someday. You always meet twice, right?